Action cameras have come a long way since the very first GoPro hit the market in 2005 (it used 35mm film, if you can believe that.) They’ve increasingly shrunk in size, and video quality has improved dramatically with each new generation. Many offer rear LCDs (a rarity a few years ago), some are even waterproof/shockproof without the need for a case and certain models can even be used for live broadcast. All of them pair with dedicated apps. Of course, there are a lot of action cameras available on the market, but there are far fewer capable of 4K video capture. 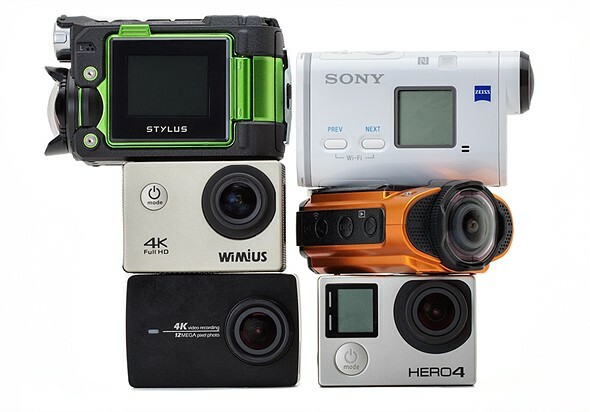 This roundup takes a look specifically at several of the most popular 4K action camera models as well as some lesser known ones too. While Sony and GoPro are both big names in the action camera world, and Ricoh has been making rugged cameras for years, companies like Yi and Wimius may be less familiar. Both are convincing GoPro lookalikes that retail for far less. The Yi 4K sells for $250 and in many ways out-specs the GoPro’s current flagship. The Wimius Q1, on the other hand, retails for around $70 and was included in this roundup as the inexpensive dark horse in the 4K action cam race. In addition to 4K action cameras, this roundup also includes the Olympus TG Tracker, a video-capable data-capturing device (read our shooting experience). It has the ability to not only record 4K video but also capture information like altitude, temperature, location, acceleration and more. *Note: Due to technical issues, we were unable to shoot 4K footage with the Sony X1000V at Mount Hood. Sample 4K footage from the X1000V can be viewed here.